A friend sent me this link to a bunch of slick-looking automobile posters. These are from Tascen's Automobile Design Graphics, which has 500 car advertisements across eight decades. 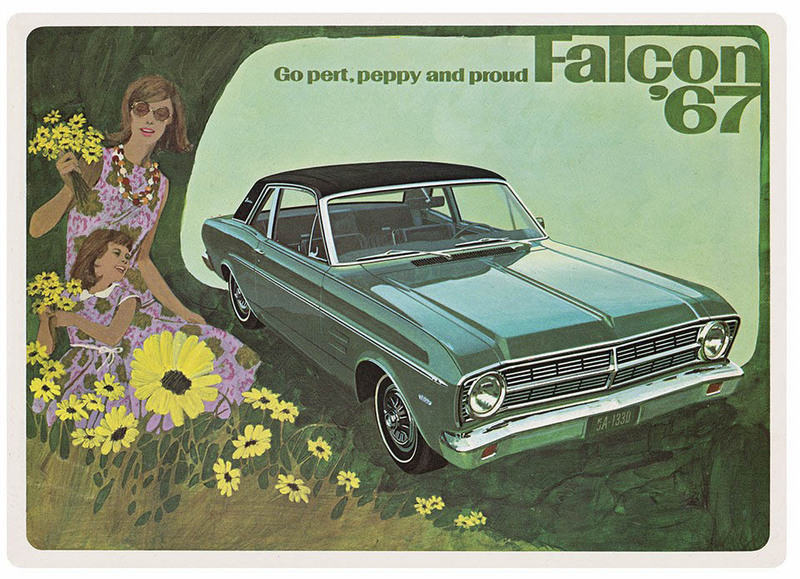 One of the fascinating ads here is the one for the '67 Falcon. There's a tricky problem advertising a product you really would prefer people don't buy (because you'd rather sell them a more expensive model). So you have a plain product shot. Relative to the others on this page, it looks dorky. And it's for a guy who can't afford to take the family somewhere nice, or at least cruise around Mulholland Drive -- the best you can do is take them out to pick flowers in a field. If you were a real man, you'd get a Mustang! Look around the showroom and spend some bucks, man! Are they trying to sell O'Douls, or are they really trying to un-sell you? Now just above the Falcon ad you have the 1957 VW bug ad. That's another cheap car, but that's the only car VW had on the US market at this time, so they aren't worried about downselling you. 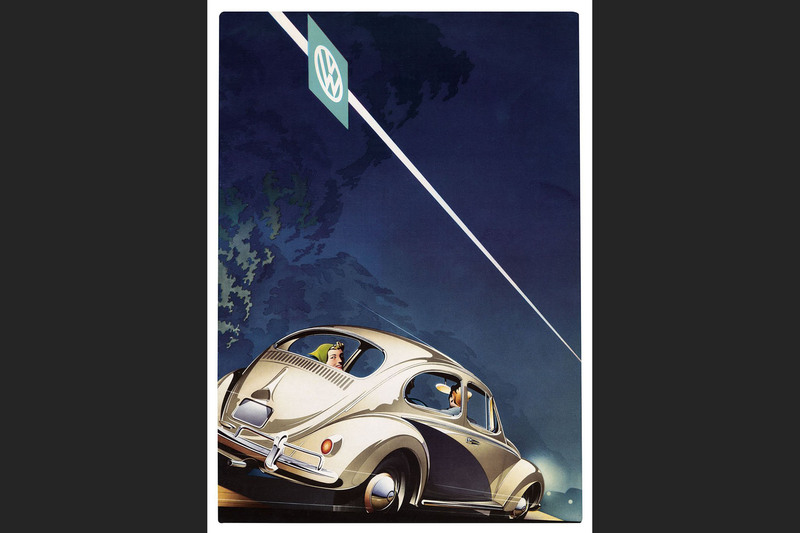 You can feel the excitement in this illustration, although in a real VW beetle you'd mostly feel bumps The Volkswagen advertising in the 1950s and 1960s was some of the best advertising ever. Now, the expert commentary on the Falcon ad says this was an ad aimed at women -- e.g. as a car to take the kids to school in, etc. That makes some sense. But note that the ad still can't bring itself to actually have the woman drive the car. In those days, women only drove cars when the husband wasn't in the car.